Exhibition Video by Studio Azzurro — The metaphorical sculpture of desiccated red clay symbolizes the crumbling and parched meandering Omo riverbed deprived of its annual flood cycle by controversial Dam developments. Click installation image above to enlarge. We are our stories—stories that can be both a cage and an opportunity for freedom. Liberation, in fact, is always partly a process of storytelling, as breaking silence means carrying a legacy. Listening to the voices of the peoples of the Omo riverbanks will therefore lead the audience into a journey of discovery where they will be able to, by listening to their words and looking at their visages, absorb the reality of their fears and hopes. MILAN, ITALY — July 14, 2018 — The Museo delle Culture (MUDEC) Milan, Italy debuts a new media art installation entitled If Only the River Remains to Speak as part of the exhibition Future Geographies, opening to the public Oct. 1, 2018. The project combines the artwork of American photographer and educator Jane Baldwin (Kara Women Speak) with the creativity of the renowned Milanese art research group Studio Azzurro, founded in Milan in 1982. The immersive art experience deepens empathy for tribal peoples’ lives, lands and cultures caught in man-made environmental and humanitarian crises between the Ethiopia’s Omo River Valley and Kenya’s Lake Turkana watershed. The project aims also to raise awareness about the vital work of Survival International, the global movement for tribal peoples. In June 2018, the UNESCO World Heritage Committee officially inscribed Lake Turkana as a World Heritage "in danger" site. The art installation, If Only the River Remains to Speak, tells a present-day story of a river and the people that it sustains—narrated mainly in the voices of the women. As visitors enter the darkened space, they are welcomed by the ambient sounds of flowing water mingling with the voices of women of the Omo River watershed, which changes in relation to where they are standing. At the center of the space, a metaphorical sculpture of red clay symbolizes the Omo River’s meandering course. 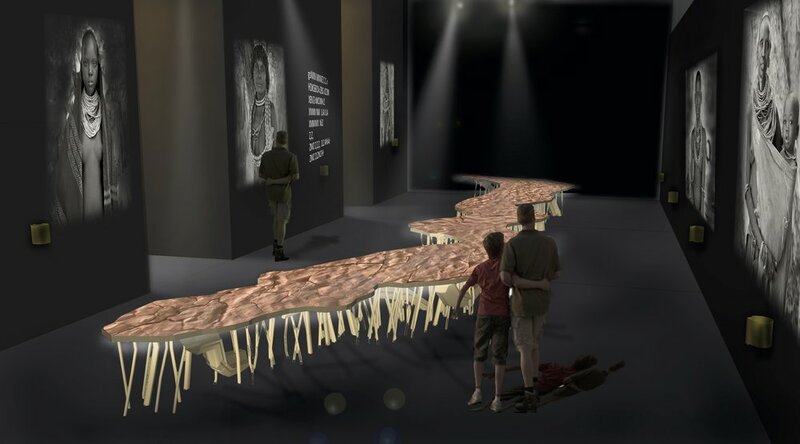 Each participant follows the symbolic river and selects one of the many clay fragments from the sculpture—the red, desiccated surface of the river indicates the crumbling and parched riverbed, deprived of its annual flood by a controversial development project on which Italy plays a key role. The visitor approaches the external screen-walls with the clay fragment in hand to drop it into one of the protruding receptacles, triggering the start of a people’s image and story. Their photographs and stories gradually emerge in the shared space of the exhibition, interlacing and overlapping before diving back in the gurgling voice of the river, which eventually remains alone to speak. Over the past ten years, the Omo River watershed’s ecosystem and the people it sustains have been threatened by complex environmental and humanitarian crises, generated by the construction effects of a massive up-river hydroelectric power project made in Italy and international land grabs for huge agro-industrial plantations to grow cotton and sugarcane––all for export. Museo delle Culture, Milan, Italy, (MUDEC) presents Future Geographies, an exhibition that gives voice to contemporary explorers and is dedicated to the social, artistic and cultural exploration that has characterized the more recent post-colonial history. For more information please view translated press release.